Digital diplomacy may be viewed as a multi-faceted form of diplomacy. As a tool for public diplomacy, it may be used to communicate directly with foreign populations thereby facilitating the acceptance of one’s foreign policy. As a nation branding tool, it may be used to shape and manage a nation’s global image. Digital diplomacy may also be used at the bi-lateral and multi-lateral levels as a tool for gathering and disseminating information between diplomatic institutions. 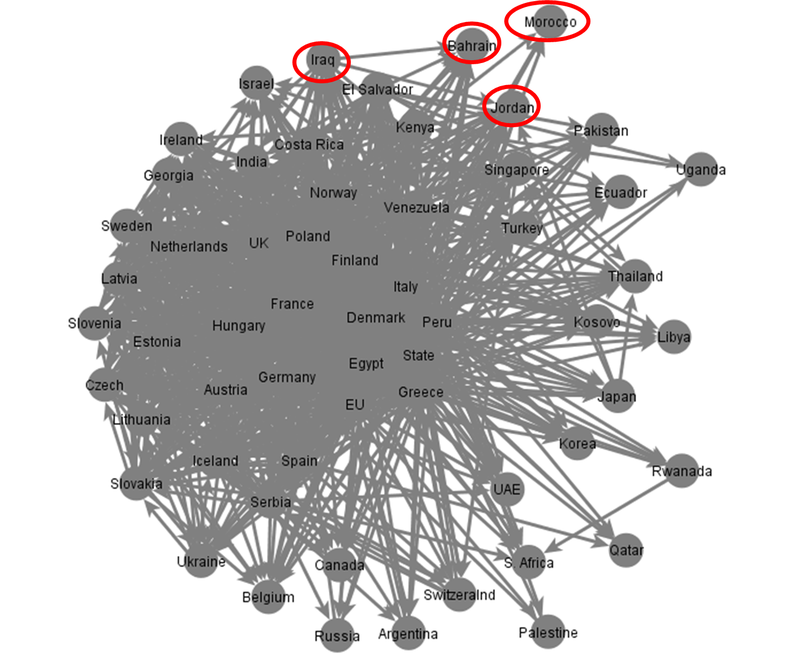 Exploring the use of digital diplomacy as a means of communication between diplomatic institutions may be achieved through network analysis. Such an analysis examines the degree to which such institutions form global networks of information. After evaluating the social networks of foreign ministries (MFAs), Foreign Ministers, UN Embassies in New York and Geneva and world leaders, I set out to investigate the social network of bi-lateral embassies to the United States. While much has been written about the end of the American century, there is little argument that the US remains a global superpower and one of the more important hubs of diplomacy in the world. My sample included the twitter accounts of 58 foreign embassies to the US as well as the State Department’s official English twitter channel. I included the State Department in this analysis given a desire to assess its centrality in this social network. The more central the State Department, the greater its ability to gather information from foreign embassies and disseminate foreign policy messages to these embassies. The image below illustrates the Social Network of foreign embassies to the US. 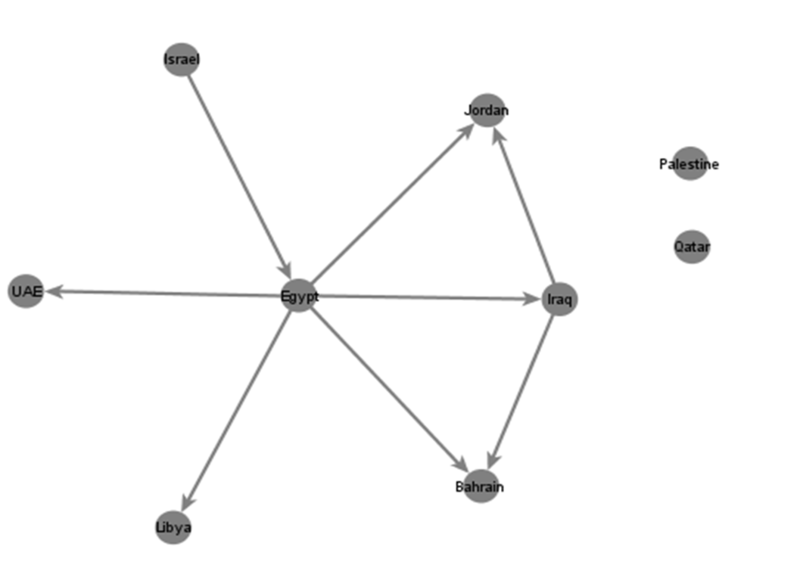 Note that the gray dense area represents the core of this network. In order to analyze this social network I calculated three parameters. The first is the in-degree parameter which measures the popularity of each embassy in the network. This is an important parameter as the more popular an embassy, the greater its ability to disseminate information throughout the entire network. 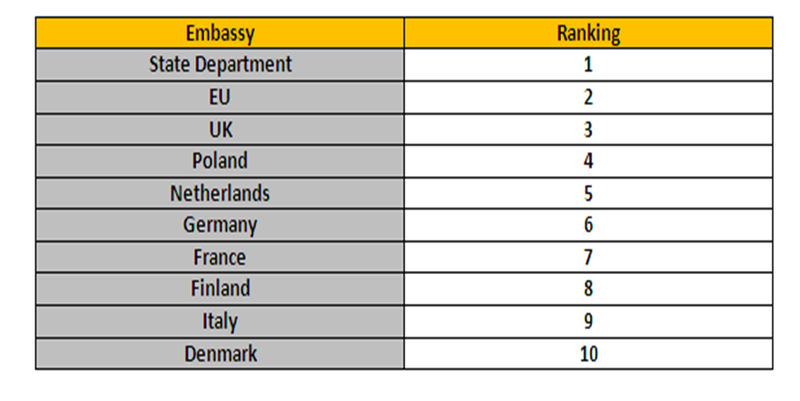 The table below presents the 10 most popular embassies in this network. The image below shows the location of these embassies in the social network. It is important to note that the US State Department received the heights in-degree score coming far ahead of the EU which has the second heights score. This finding demonstrates that the State Department is in a position to immediately disseminate foreign policy messages to the international diplomatic community. It should also be noted that the embassies with the highest in-degree scores are all European. There is no Arab, Latin American or Asian nation whose embassy received a high in degree score. The second parameter I calculated was the out-degree parameter. This indicates which embassies are the most avid followers of their peers on twitter. This parameter is also of great importance as the more embassies one follows, the greater his ability to gather relevant information and anticipate foreign policy initiatives. The table below presents the 10 embassies that are most avid followers of their peers on twitter. Embassies with high out-degree scores come from diverse geographic locations including the Middle East (Egypt), Latin America (Peru) and the Pacific (Australia). It should be noted, that the US State Department received the lowest out- degree score. Presently, the State Department does not follow any foreign embassy to the US. This finding is quiet surprising and may suggest that the State Department is unable to gather vital information regarding other countries’ foreign policy. However, it is possible that the State Department uses a different twitter account to monitor the social media activity of such embassies. NOTE: following the publication of this post, the Twiplomacy organization alerted me to the fact that the US State Department uses its @US_Protocol channel to monitor DC embassies online. My consequent evaluation showed that of the 58 embassies in my sample, only 30 follow the @US_Protocol channel as opposed to 55 that follow the . @StateDept channel used in my social network analysis. This begs the question if the State Department should not consolidate such channels so that it can receive information and transmit information to DC embassies through one channel alone. Finally, I calculated the Betweness parameter. This parameter identifies which embassies serve as important hubs of information as they connect embassies that do not follow one another directly. The table below presents the 10 embassies that received the highest Betweness scores. These are also identified in the image that follows. With regard to the Betweness parameter, it is important to note that the US State Department received a very low score most likely as a result of the fact that it does not follow any foreign embassies. This finding indicats that the State Department fails to serve as an information hub for foreign embassies to the US thus decreasing the importance of its twitter channel in bi-lateral diplomacy. An interesting finding is that Egypt and Norway’s embassies to the US received extremely high Betweness scores being ranked at number 11 and 12. It is the high score of these embassies, along with the Greek, Polish and Peruvian embassies, that demonstrates the manner in which smaller nations can use digital diplomacy and social media to position themselves at the heart of online diplomatic activity (a phenomenon I refer to as social media mobility). The only embassies to receive high scores on all three parameters were: EU, Poland and Denmark. There are three more findings that warrant further elaboration. The first is that I found no examples of follow-mies (enemy countries that follow one another on twitter) in the social network of foreign embassies to the US. For instance, Russia and Ukraine’s embassies to Washington do not follow one another on twitter. Likewise, Israel and Arab nations do not follow one another on twitter. As can be seen in the image below, Israel only follows Egypt while no Arab embassy follows Israel. Moreover, the Arab world seems quite disconnected as most Arab embassies to Washington follow only one of their regional peers (e.g., Iraq follows Jordan, Iraq follows Bahrain). The only embassy to actively follow its peers is Egypt. However most Arab embassies do not reciprocate and follow Egypt’s embassy in return. While Arab nations may be moving closer together in the Middle East, they remain disconnected in Washington D.C. especially Qatar and Palestine which are not followed and do not follow any of their regional peers. Secondly, as is the case with the social network of foreign ministers and foreign ministries, Kenya’s embassy to the US is the only African embassy situated near the core of this social network as seen in the image below. Also evident in the image is the peripheral location of Russia’s embassy to the US. Finally, as is the case with most social networks of diplomatic institutions, certain clusters of nations can be found in the social network of embassies to the US such as the Arab world cluster and the Eastern European cluster shown in the images below. Posted in Uncategorized and tagged Bi Lateral, Digital Diplomacy, Multi Lateral, Network Analysis, social network, State Department, twiplomacy, Twitter, US, Washington. Bookmark the permalink.